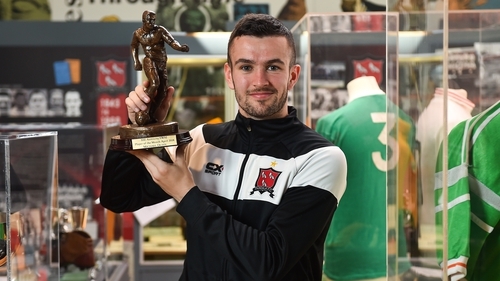 Dundalk winger Michael Duffy has been named the SSE Airtricity/Soccer Writers’ Association of Ireland Player of the Month for April. It is the first time Duffy has won the monthly award. The 23-year-old was key for Stephen Kenny’s men during the month with three goals and three assists and he believes, while Dundalk are pleased with their start, there is still work to do for the league leaders. Duffy said: "I'm delighted to win it. It was a good month for me with three goals and three assists. I'm hoping I can just keep that up now and kick on again. "We've dropped a few stupid points and we’ve been a bit unlucky but we're playing well overall. We've been tested with injuries too but it just shows the depth to our squad. "The league is tough this year. We've been top and then Cork and so on. Waterford and Derry City have been up there too. With teams playing each other four times I think it's very tough." Duffy has set himself some high targets as he aims to dominate with the Lilywhites. He added: "At the start of the season I said I wanted to get into double figures. I'm at eight goals now so hopefully I'll be well into that. I'd like to keep chipping in with assists too. "We have a very strong squad here. I'd love to do well in Europe and do what the Dundalk teams over the last couple of years have done." In winning the award, Duffy saw off competition from Derry City’s Aaron McEneff, who finished second in the voting. Bohemians midfielder Dylan Watts was third.